Location : Ranthambore National Park is situated in Eastern Rajasthan, where the Aravali Hill ranges and the Vindhyan plateau meet near Sawai Madhopur in Rajasthan. Best time to visit : During the months of October - March and April to June. Ranthambhore National Park, once the hunting preserve of the Maharajas of Jaipur is bounded by the rivers - Chambal in the South and Banas in the North. The prime focus of the park are the six man-made lakes and the various perennial streams interwining the entire park. The Ranthambore National Park possesses an internal drainage system with no link up with any river system inspite of the fact that two rivers bound the Park in its northern and southern side. The park deriving its name from the 1000 years old fort is the best place on earth for the wildlife photographers and nature lovers for its picturesque surroundings, exquisite landscape and rich wildlife. The Ranthambhore Fort (from which the park derived its name) is one of the most spectacular and commanding sites amidst the park area. This impressive fort also houses several sights withins its complex, which are worth visiting. Air : Jaipur at 145-kms and is the nearest airport from Ranthambore wildlife sanctuary. Rail : The park is stationed around 11-kms away from Sawai Madhopur railway station, which lies on the Delhi to Bombay trunk route. Road : A good network of buses connect Sawai Madhopur, the nearest town from Ranthambore to all the major cities within the state of Rajasthan. The Park covers a small area but has a rich diversity of various species of fauna and flora which covers 300 trees, 50 aquatic plants, 272 birds, 12 reptiles including the Marsh Crocodile & amphibians and 30 mammals. The Flora : The park is dominated by old Banyan Trees, Dhok & Pipal trees, clusters of mango trees. The terrain comprises of massive rock formations, steep scarps, perennial lakes and streams and forest giving way to large areas of Savannah. The terrain of the sanctuary ranges from impregnable dense forests to open bush lands. The prime vegetation in the forest is the typically dry deciduous type, with Dhok, being the most common tree. The Fauna : The Park is known for the wild Tigers and is a favorite with photographers. 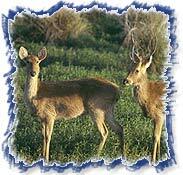 Ranthambore wildlife sanctuary has a great variety of flora and fauna. Tigers, the pride of the park makes it one of the best places in the country to observe them. Besides Tigers, a large numbers of Sambar, Chital, Nilgai, Gazzelle, Boars, Mongoose, Indian Hare, Monitor Lizards and a large number of birds can be seen in the park. Jeep and Elephant safari are the two most ideal ways to explore the rich wildlife at Ranthambhore.